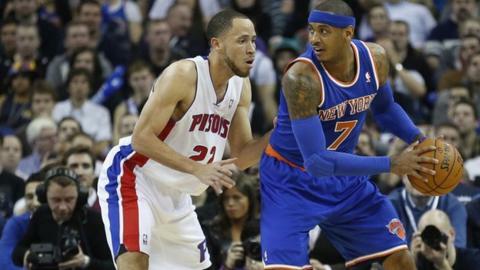 Carmelo Anthony inspired New York Knicks to a comfortable 102-87 win over Detroit Pistons at a sold-out O2 Arena. This was the third regular season NBA game to be held in London in what was a 'home game' for the Pistons. But the Knicks were in control from the start with Anthony collecting 26 points in a dominant performance. Will Bynum starred for the Pistons with 22 points but they were off the pace as the Knicks strolled to victory. Pop star Alexandra Burke sang the British national anthem before the start but there was still a very American feel to to the event with plenty of celebrities watching on. A number of Premier League stars were in attendance including Chelsea's Ashley Cole, Aston Villa's Darren Bent and Tottenham's Clint Dempsey. Former Arsenal star and current New York Red Bulls forward Thierry Henry also watched from courtside along with film director Spike Lee and former British tennis star Greg Rusedski. However, there was only one star on the court when the game began and that was Anthony as he returned to the venue where he won Olympic gold with United States at London 2012. The forward racked up 11 points in the first quarter to help the Knicks to a 29-17 lead. The Knicks came into this as favourites despite losing three of their last four games as they top the Atlantic division of the Eastern Conference. Even though they had nine turnovers in the first two quarters, their 56-41 lead at half-time reaffirmed their superiority. However, the 'hosts' did not lie down and, inspired by Greg Monroe and Bynum, they got within four points of their opponents before a late burst at the end of the third quarter from the Knicks put them 12 points ahead going into the final 12 minutes. Led by Anthony along with Tyson Chandler, who collected 10 points and 14 rebounds in the game, the Knicks continued to dominate in the final quarter and extended their advantage even further by the end.